Prominent & Leading Manufacturer from Bengaluru, we offer twill tape, cotton twill tape and special tape. We are a remarkable entity, engaged in offering a superior quality range of Twill Tape. 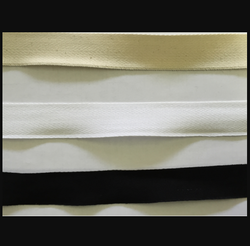 Our company has gained immense popularity in the domain of manufacturing, exporting, importing, distributing and wholesaling of cotton twill tape. 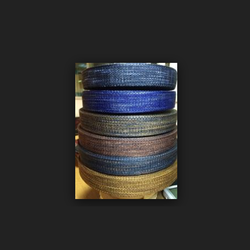 We are offering Cotton Twill Tape to our clients. Backed by a team of highly skilled professionals, we manufacture and supply a varied range of tapes in varied sizes and dimensions as per the requirements of our clients. Applications Label printing, garment accessory, bags, suitcases etc. We are offering Special Tape to our clients. Backed by a team of highly skilled professionals, we manufacture and supply a varied range of tapes in varied sizes and dimensions as per the requirements of our clients. We are offering Twill Tape to our clients. Backed by a team of highly skilled professionals, we manufacture and supply a varied range of tapes in varied sizes and dimensions as per the requirements of our clients. 100% polyester yarn dyed azo free quality.